The real hero of this story is dead. You should have met him. He was a beautiful man. The love of my life. I didn’t deserve him. Now what’s left are the jagged edges of the person I am without him, and what I have to do to get by. This isn’t even a story about love. Not really. It’s a twisted tale of revenge and hate—a happily never after. The only man in my life now is the one I have to kill. I used to be a wife. I used to be a mother. Now I am the Revenger. “What the hell are you?” He searched frantically for the door latch, his panic making him oblivious to the open top of the Jeep above him. He didn’t deserve an answer, and he wouldn’t get one. Only in her head would she respond. She pulled him from the backseat and held him aloft, thinking, I’m a mom without a reason. I’m a person without a life. I’m dead with no escape. 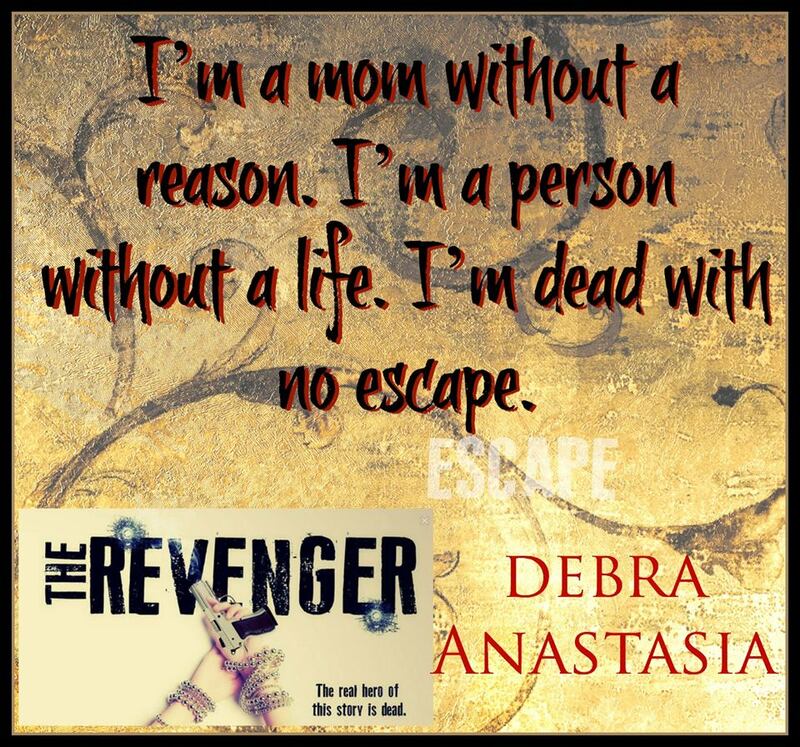 Is there no end to the talent of Debra Anastasia? From the Paranormal Seraphim series, to the dark and gritty Poughkeepsie series and then to the hilarious and down-right filthy Gynazule series, Debra Anastasia now brings us a raw, gripping, emotional story with a slight fantasy element. 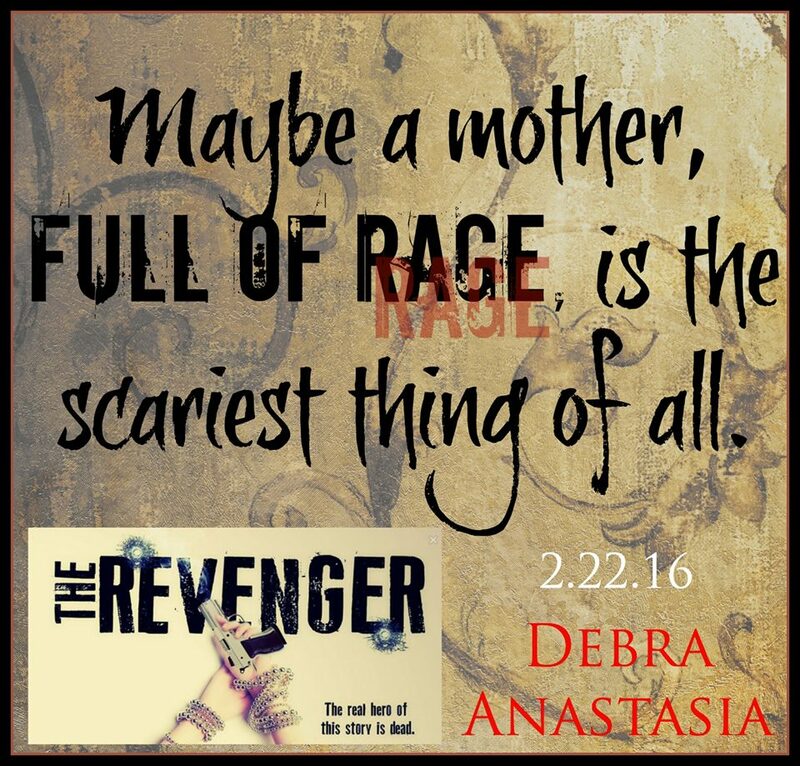 The Revenger was not what I expected, but none the less I was pleasantly surprised and couldn’t put it down. The heroine of this story is Savvy. Savvy is at her very lowest ebb having lost everything in the world that mattered to her. Her husband and daughter were tragically killed in a car accident and she has the hugest dose of survivor’s guilt. Savvy just wants to die so that she can be with her family once again, but with her brother staying with her to keep her on the straight and narrow he won’t let her give in. 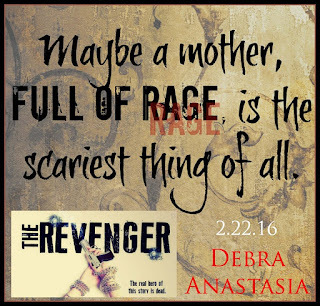 The Revenger begins one year after the accident. The accident that Savvy and her family were involved in was with a chemical tanker and Savvy had been exposed to the liquid before the tanker had exploded. So far she has not had any symptoms coming from that exposure but having decided to take her own life once again she soon finds that it may be harder than she first anticipated and maybe that chemical was having an effect on her body after all. I don’t want to go into any details as you should really read this for yourself and see how Savvy comes to be The Revenger. This book, as I said does have a fantasy element to it but none more so than some cartoons that I had read and watched as a child and while probably unlikely in the real world did not stretch my imagination that much and is definitely a possibility seeing as chemical warfare is becoming something that hits the headlines on a more regular basis these days. But this side of the story is not really what this book is about but is more a means to an end to deliver the real moral of this story. Good vs evil is always a winning message and I could really see this book on the big screen as one of those action packed movies that keeps you glued to your seat as you munch your way through a bucket of popcorn. Savvy gets rewarded for ridding the world of bad and even more so for turning the bad to good. With auras as her guiding light her fight is fierce and nothing more gives her hope for her future and her end goal. With mob bosses at the forefront of her fight you always know that it is going to be an uphill struggle but Savvy is determined, sassy and takes no crap, no matter how scary the adversary and with very little regard for her own life. Think the Mrs of Mr & Mrs Smith on speed and in killer heels. Debra Anastasia introduces some great side characters that have a huge part to play in the story and each one brings something different but gives depth to this action packed read. I adored Boston and was desperately hoping for an outcome that I knew was not within the realms of possibility, however, it didn’t stop me from wanting. There was always an inevitable end to this story but none the less, knowing did not lessen the emotional impact. But kudos to Debra Anastasia for delivering it with honesty and sticking to her guns. Savvy was a woman on a mission and at the end of the day she achieved her goals with venom and flair, she was a force to be reckoned with, she reduced grown men to tears but she definitely goes out with a bang. Long live Savannah Raine. What would you do for your kids? Hurt, kill, and move mountains for my kids!!! My kids are not prefect but they are too many adults who take advantage or harm innocent kids or are reckless. I don't have kids (and have no plans to have any) but I love my family very much and there's nothing I wouldn't do for them. There's nothing I wouldn't do for my kids. They are the loves of my life and it's my responsibility to protect them. Same here, I would do anything for my children's sake. I don't think there is anything I wouldn't do for my children.